Granby Ranch no longer owes back taxes to Grand County after fully paying their outstanding tax obligations late last week. 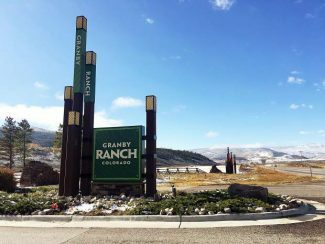 On Wednesday morning, officials from the Grand County Treasurer’s Office confirmed that Granby Realty Holdings LLC, the development company behind Granby Ranch, paid its outstanding tax obligations owed to the county. Granby Realty Holdings covered a payment totaling $381,774.39. The payment made by Granby Realty Holdings pertained specifically to outstanding real property taxes. Real property is defined as fixed property and typically entails land and buildings. The payment made by Granby Realty covered tax debt owed by the entity for 2015 and 2016. In a statement printed in Wednesday’s edition of Sky-Hi News, Granby Ranch founder and principal, Marise Cipriani, announced the recent tax payment. “We are pleased to say that as of Oct. 19, 2016, all of Granby Ranch’s personal property taxes and real property taxes have been paid in full,” Cipriani stated. Last week’s tax payment by Granby Realty Holdings comes on the heels of an incident that occurred on Oct. 3 when officials from the Grand County Treasurer’s Office, with assistance from the Grand County Sheriff’s Office, seized personal property located in and around the Granby Ranch Resort base area, due to failure to pay personal property taxes. Granby Ranch Chief Financial Officer Dustin Lombard presented county officials with a check covering over $100,000 in outstanding personal property taxes that same morning. The seized property was released back to Granby Ranch shortly thereafter. At that time, County Treasurer Christina Whitmer noted Granby Realty Holdings still owed real property taxes to the county for the previous two years. A statement issued by Granby Ranch CEO Melissa Cipriani two days after the seizure incident said Granby Ranch planned to pay their outstanding real property tax debt no later than Oct. 25. In her statement, Melissa Cipriani went on to explain the circumstances surrounding Granby Ranch’s then outstanding tax obligations. Cipriani went on to explain Granby Ranch filed an insurance claim related to the incident but as of early October, the resort had not received “any financial relief from them due to business interruption,” the statement said. “Because of their belief in Granby Ranch and our management team, on the evening of Oct. 4, we received approval for an additional loan that will provide the funds we need to maintain operations and pay all outstanding obligations,” Cipriani stated. Granby Ranch is currently preparing for the start of the winter ski season; the resort plans to open Dec. 15 this year, weather permitting.